Donated by Art Rice III and his sisters Carol Bowditch and Emily Douglas, Craftsbury Preserve totals twenty-one acres, making it the second largest donation CFC has received. Craftsbury Preserve is an intriguing property that contains both wetlands and uplands. We have received donated uplands of this size only once before in our history, at Grigsby Prairie. 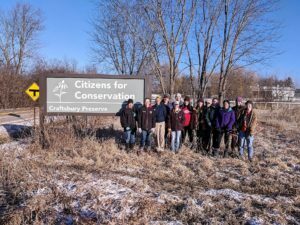 Thus CFC has the opportunity to restore prairie in conjunction with wetlands. This scenario allows for high biodiversity. The wetlands still contain native plants; buckthorn overruns the uplands, but we will use our award-winning restoration techniques to transform them. Restoration work began in 2015. CFC’s original Craftsbury Preserve at Cuba and Hart Roads, donated by the Rice family, is 21 acres. Our restoration of this former farmland began several years ago with clearing the first five acres choked with invasive buckthorn. We are accomplishing a major move forward in 2019 with the help of a generous grant from the Illinois Clean Energy Community Foundation. We have cleared an additional 4 acres and are presently conducting the detailed follow-up necessary to keep invasive buckthorn and reed canary grass from resprouting. Restoration volunteers under the leadership of our Restoration Program Manager have spent over 400 hours so far since the end of 2018. Restoration is a multi-year project, so we know we will be at it for a long time, but we will be ready in the fall of 2019 to start seeding some of the cleared areas. In the future there will be a walking trail for CFC members to observe the restored prairie, wetland and savanna and the biodiversity returning to this improved habitat. CFC is excited to announce that we have acquired an additional 31 acres adjacent to the original property, west of Hart Road. Restoration on this land will begin later this year. 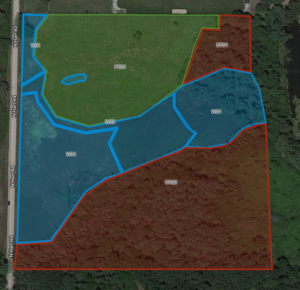 Combined, these two sections of Craftsbury Preserve will be CFC’s second largest restoration, after Flint Creek Savanna which has grown to 155 acres. We are working hard to improve the habitat, biodiversity and open lands that make Barrington the desirable location that it is.